Fáilte is fiche romhaibh go dtí suiomh idirlín Ghaelscoil Osraí. Tá scoil bríomhar, dearfach againn anseo i gcathair Chill Chainnigh ó 1984 ar aghaidh agus tá 454 dalta againn i gceann de na Gaelscoileanna is mó in Éirinn. Táimid an bhródúil as an t-árd chaighdeán oideachais agus múineadh atá againn i ngach ghné den gcuraclam. Ach go háirithe, cuirimid béim ar leith ar príomh-theanga ár scoilne, an Ghaeilge, ceann de na teangacha is ársa agus is sinne san Eoraip. 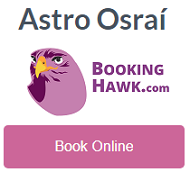 Is scoil í seo chomh maith go bhfuil béim ar na codanna eile do chultúr na hÉireann inár n-amhráin, ceol agus spoirt dúchasacha-iomáint, peil gaelach, liathróid láimhe agus corr. Is scoil Chaitleacach sinn faoi choimirce deoise Osraí agus faigheann ár bpaistí oideachas spioradálta sa chultúr sin Chríostaíoch. Tá súil againn go bhfaighfidh tú gach eolas fúinne anseo, ach má tá ceist agat nó breis eolais uait, déan teangmháil linn sa scoil agus freagróimid aon cheist más féidir linn. 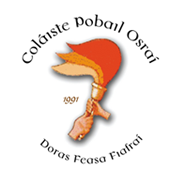 You are very welcome to the website of our school community here in Gaelscoil Osraí. We like to think we are a lively, positive school which has been here in Kilkenny City since 1984. We have 454 pupils, making us one of the largest Gaelscoileanna in Ireland. We are hugely proud of the very high standards of education and teaching in our school in every aspect of the school curriculum. In particular, we place our central emphasis on our first language, Gaeilge, one of the proudest and oldest European languages. We also promote the other key elements of our traditional national culture including our traditional songs, music and sports with hurling, gaelic football, handball and rounders to the fore. We are a Catholic school, under the patronage of the bishop of Ossory and our children receive a spiritual education reflecting that Christian ethos. We hope you get all the information you need about our school on this website, but if you have any further questions about us or our school, don’t hesitate to contact us and ask and we’ll do our best to answer.